RS: One thing I was a little surprised at on the Conspiracy album is that there was no lyric sheet included. CS: We actually didn’t want to. We made a personal decision not to put a lyric sheet in. And there was no other reason other than that all Yes albums have these reams and reams of pages of lyrics and we just kind of wanted it to look different from a Yes album by not having them. RS: I heard that future Conspiracy albums may feature contributions from other players and former Yes members such as the two Trevors, Rabin and Horn. CS: It’s possible. The Conspiracy is a fluid thing. It’s basically Billy’s and my project but there could be other people involved from time to time. And so far on the second album it’s just been he and I who’ve worked on it. We don’t have any guests on it at present. RS: So the Conspiracy album shouldn’t be looked at as the long awaited follow up to your ‘75 solo album Fish Out Of Water. CS: No, it’s not really like a Fish Out Of Water 2 or anything. It’s a different kind of a record. It’s a song record. And it’s really kind of documenting the life of Billy and myself writing together really. That’s kind of what it is. RS: I was reading in another interview Billy saying that you had it in you to make another album along the lines of Fish Out Of Water. Say the more orchestral and ambient pop kind of sound. Would you be interested in making another record like that ever again? CS: Yes, I might be. But it’s always a little bit daunting to consider it because Fish Out Of Water, and I’m not trying to be boastful here, but it worked out real well. Such a topic wouldn’t be that easy to try and do exactly the same kind of thing again. So, however I would definitely consider working together again with Andrew Pryce Jackman, who worked with me on the orchestral side of Fish Out Of Water, and some of the writing too in retrospect I realize was his. So that’s something that could happen one day even though he’s in Norridge in England and I’m in Santa Barbara. So it’s like at some point we might organize a way to get that together ‘cause we still talk now and again. RS: Could I just change the subject to Yes and The Ladder? RS: I want to tell you that I thought The Ladder was possibly my favorite album of 1999. I thought the band really achieved a perfect balance between say the progressive art-rock of the band’s finest and a catchier pop kind of vibe going on there. RS: But the album was finished though wasn’t it? CS: No, it wasn’t mixed which was the problem! And that’s really where the producer comes in. His forte comes in. Even though Bruce had been really helpful in selection of tracks and which directions we should go in, etc. It was still a shame that he wasn’t there to actually put his personal touch on the mixing. RS: How would you sum up Bruce’s contribution to The Ladder? CS: He was a good referee during the song selection process and I enjoyed working with him. I mean, we didn’t always see eye-to-eye but it was for the right reasons. And we certainly were both very happy with the way that the bass guitar contributions turned out when I’d done with that. He was happy with alot of what I’d done, vocal parts, etc. So then really the only thing left was for him to finish a few vocals with Jon and mix it and then I guess, y’know he left us and it was all left up in the air to be honest. We should have taken a step back really and waited for a month or something before finishing it, but there were pressures. There were touring pressures, etc., that demanded that the album really be finished in spite of him not being there. 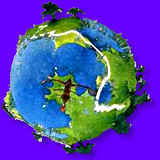 RS: The Ladder’s alternate title track “Homeworld” was brilliant. How did the ideas bounce back and forth regarding that song? CS: Well yeah, “Homeworld” was very much based, musically around a chord sequence of Billy Sherwood’s that we worked on in rehearsal and molded into various Yes versions of the original. And of course Jon added the lyrics, which also were supposed to be associated with this video game, Homeworld. And actually the chordal changing chorus, the keyboard-y kind of changing, I don’t know if you’d call it the chorus so much, was really something that I’d worked on with Igor (Yes keyboardist Igor Khoroshev) and kind of put together. RS: So Jon wrote most of the lyrics to The Ladder. CS: He ended up writing all the lyrics. For some reason he wanted to write all the lyrics on the album. RS: Were any of the Conspiracy tracks ever thought of as possible candidates for The Ladder? CS: Not really because the way we went into that album was we all went to Vancouver in November of ‘98 expressly to create the whole thing from the ground up. So although some of the ideas may have been ideas that Billy and I had that we were thinking of using for other songs, which may have been there somewhere in the original contribution, y’know...we wanted to keep it as open as possible so that everyone could bring in their own ideas and we could really create a magic spot between us in the studio which worked to varying degrees. Sometimes really well other times not so well, which is what you’d expect really under the circumstances. RS: The final track on The Ladder, or the cut before the final cut, “New Language” was, for me, the defining moment on the album. It kind of reminded me a bit of The Yes Album days. CS: What made you think it was Yes Album-y? RS: Just the way the lyrics would effortlessly flow with the melodies. The lyrics and the melody were very balanced, I thought. It was just a magical mix. RS: It’s funny, the bio I got from the record company said The Ladder took it’s name from a 1968 Yoko Ono art exhibit where she first hooked up with John Lennon. CS: I have no idea why it said that. I guess some clever PR guy thought to put that in. RS: So that’s not really accurate? CS: No, I don’t think so (laughter)! I know we’d just been working on that track before it became “Homeworld” and it was called “The Ladder” and I wasn’t aware that it had anything to do with Yoko Ono. RS: I don’t know, but from my standpoint there seemed to be an interesting connection, even if it’s not, because I wrote a story in the November ‘99 issue of 20th Century Guitar about all these great artists from 1969 who made new albums last year and it seemed as though while The Beatles ended their career in 1969, Yes was first beginning. And I thought there was this sort of pop ladder from 1969 to 1999. CS: Maybe. I always just thought The Ladder is a very positive title about going up the ladder, planning for the next level. Just as a positive thing of achieving really. That’s what I always say when asked about the title. RS: Could you say anything about any new Yes album on the horizon? Is there any new Yes album being planned? CS: Not yet, no. We haven’t quite gotten around to that. We’re still in touring mode at the moment. We’re doing another U.S. tour next June, July and August. RS: Any new producers to speak of? CS: No, it’s a bit early for all that. RS: It seems like just yesterday the The Ladder came out and now the new Conspiracy CD. That’s alot of great music. CS: Yeah, we’ve been working pretty hard since mid ‘97. And it’s like I think were going to probably slow it down a little bit now. I don’t know if were going to be rushing straight into another album. But who knows. There’s various projects that are always being talked about. Like there’s a project of working with the Boston Symphony Orchestra on doing some Yes classic stuff with the orchestra. You know, it’s not definite but it’s been talked about at some length. RS: You mentioned that the Yes back catalog was somewhat in limbo with Atlantic Records and Elektra Records both vying for control. RS: But definitely nothing as interesting. CS: Well...thank you. You know the way the business is. RS: I always wanted to know how Yes got signed to Atlantic Records back in the ‘60s. Do you have a short story of interest to tell? CS: It’s quite funny actually! We had an original manager. I won’t mention his name but he was a nightclub host at a big rock and roll nightclub in London called The Speakeasy where all the bands and Hendrix and all the people used to hang out. It was like a rock and roll late night club. And our manager as I said was the host there. We did a showcase gig there one night for Ahmet Ertegun of Atlantic Records who came down. He really liked the band, he loved what he saw and he got his reports I guess from his people in London that Yes was an interesting prospect. So I always remember, (laughing) being actually in the bathroom at the club and our manager coming and going saying, “wow, it’s great! The guy from Atlantic Records wants to sign us. And here’s the great part, he wants us for like 20 albums!” And we went, ‘wow, you’re kidding, he must love us!’ (more laughter). Of course later on we’d decided that was the worst thing we could have possibly signed. But, there you go. Over the years we improved our deal. We had to crawl uphill later on. RS: Looking at the quite impressive Yes back catalog, do you think there’ll ever be expanded editions of some early Yes album classics say with outtakes or works-in-progress? CS: We tried to gather anything of interest for the box set, for the Yes box set which wasn’t the greatest selling box set in the world because they put it out the week that Atco got taken over by East-West Records and it was on Atco so it never got promoted. But that’s about as far into the archives as you’re going to get I think from Yes. Then of course, there’s been the BBC tapes that got put out about a year or so ago. “Something’s Coming” and all that stuff. So it’s pretty much all covered. There’s not a lot more stuff anywhere in the closet anywhere that didn’t surface. RS: I’d love to see a concert where Yes perform live versions from various members solo albums. 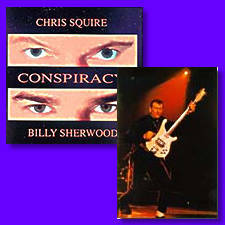 For instance Steve Howe has some great instrumental tracks from his Quantum Guitars and then of course there’s the new Conspiracy album from you and Billy. Wouldn’t it be of interest to hear some of those songs live? RS: Why not? It all sounds like Yes. Your stuff and Steve’s stuff. Whenever I hear it, I don’t even have to think. It’s like, I know that’s the Yes sound. RS: Have you ever composed any completely instrumental rock tracks? I have this vision of orchestras a hundred years from now performing Tales From Topographic Oceans. CS: Well, it’s not going to be a hundred years from now. As I said, we thinking about doing this thing with the Boston Symphony which might include songs like “The Gates Of Delirium” and “Ritual” from Topographic Oceans. We’ve been looking at that project for a while. RS: Do you spend alot of time in New York City anymore, or are you mostly in Santa Barbara? CS: We moved from there. We’re living in Santa Barbara now. RS: So you’re not intending to spend alot of time in New York anymore? CS: We might be back there eventually. We have a kid so and the New York apartment was too small and I’m going to be busy on the West Coast for a while. I’m in the studio doing various projects so...we decided to come back here for this year. RS: Chris, the first time I saw Yes in concert was back at the end of ‘71 when the band was third on the bill to King Crimson and Procol Harum at the Academy Of Music in NYC. I’m interested to know if there’ll be any surprises on the upcoming Yes tour? For instance, will you be playing any Conspiracy songs? CS: (Laughter) No, there won’t be any Conspiracy songs! Unfortunately that won’t happen. But there will be some surprises. But as I said there will be that Conspiracy tour, maybe by the end of the year. RS: Thanks a million Chris for your time! I look forward to speaking with you again. CS: OK then, look forward to it. Bye-bye.